I just finished the first 2 cakes of yarn and am pleased with how far they stretched. This fits beautifully as-is; I’m hoping it won’t grow too much when I go to block it. I’m glad I did not do as many increases as I figured I would need based on the math. 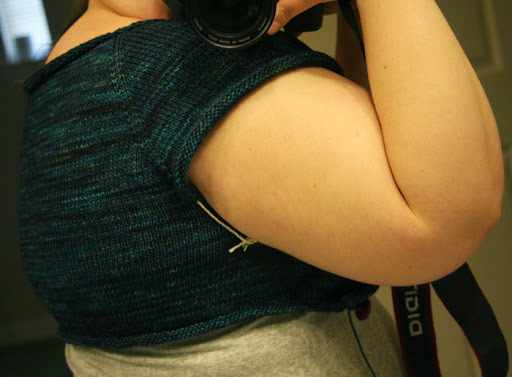 If I had, this would be quite big even before blocking. The math always worries me, because clearly, it would have led me astray in terms of fit before blocking. After blocking, my superwash wools almost always loosen up about 1/4 stitch per inch, so I figured that into things when I was calculating to get my range of increases needed. I guess I’ll know after the wool hits the water. Now that I have an idea of just how far two skeins of Sundara Sport will stretch, I’m changing directions and attacking the sleeves. I have 4 left, but I want to be sure that I’ll have enough to get the sleeves how I’d like and that will make it easier for me to tackle the body length because they’ll sit a little better. This whole “design” is being made up as I go, so I figure I may as well tackle each element when it’s convenient, rather then doing things in a traditional order: body, ribbing, and finally, sleeves. Be watching for Wednesday, kittens: I suspect quite a bit more of this will be done by then.